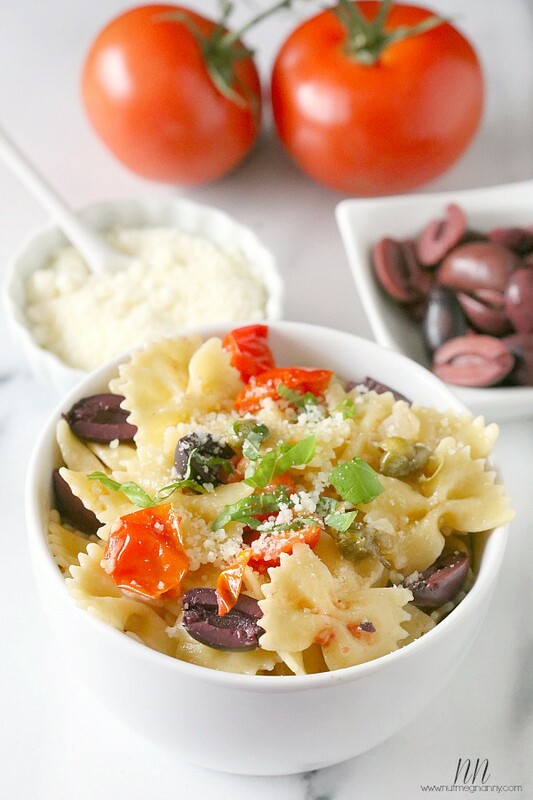 This quick and easy 20 minute Kalamata olive, tomato and caper pasta is perfect for the weeknight rush! Full of flavor and packed full of fresh goodness. My best friend has been visiting this week and it’s the best thing ever. It’s hard when you live over 500 miles away from your BFF but when they come to visit it’s almost like no time has passed. We have spent our days eating (that’s completely acceptable…right? ), laughing, drinking passion fruit margaritas and watching John Mulaney: New In Town . If you’re not familiar with John Mulaney you need to look him up on YouTube. We have been quoting him so much this week we look like complete freaks when we are out in public. We keep saying one liners to each other while other people wonder what in the hell we are even talking about. So when we are not cracking jokes that are only funny to each other (and anyone who happens to have also seen John Mulaney) we are trying to figure out what our next meal will be. 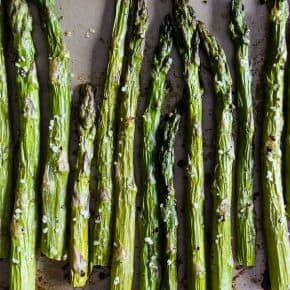 Since Jessica is a whiz in the kitchen she wanted to share with me one of her go-to quick and easy dishes. Trust me, it did not disappoint. It’s ready in about 20 minutes and is packed full of fresh flavor. We left ours protein free but I think it would delicious with some cut up grilled chicken or chunks of fresh mozzarella. Even though I’m not a big fan of olives I left them in the dish because I know my BFF and my hubs both love them. I admit that I did get a bit with an olive and I loved the brininess it brought to the bite. But, I still hate olives. In a large pot fill with water and set over high heat. Once the water is boiling add pasta and cook till al dente, following box directions. While the pasta is cooking start your sauce. In a large skillet melt butter and olive oil over medium heat. Add in onions and garlic. Sauté until the onions are translucent and the garlic is fragrant. Add in tomatoes and capers and sauté until the tomatoes just start to soften. Lower heat till low and keep warm while the pasta finishes cooking. Once the pasta is fully cooked, drain and add back to the pot. Sprinkle with 1/2 cup grated Parmesan cheese and stir. Add sauce, olives and basil to the pasta. Toss to combine and drizzle with more olive oil if the pasta is too dry. Season with salt and pepper if needed. 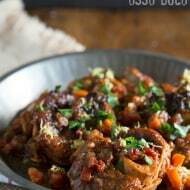 Serve warm with a sprinkle of extra grated Parmesan cheese if desired. I want this for breakfast!! 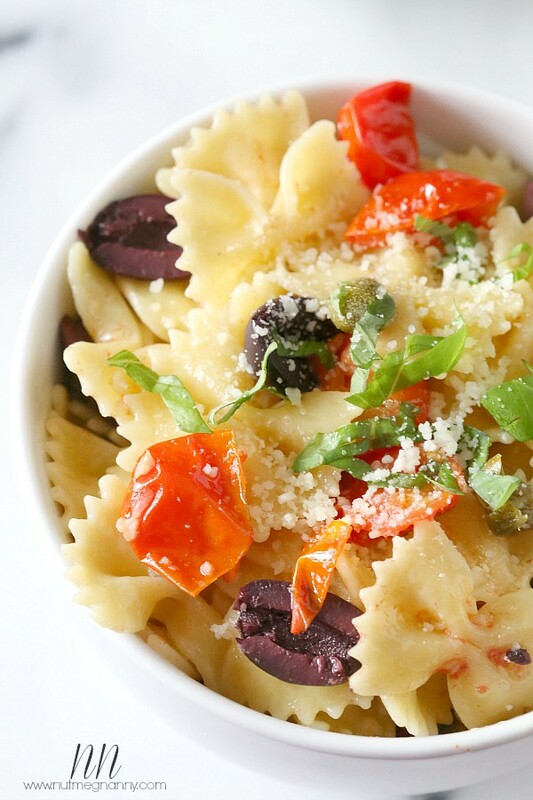 This is a gorgeous pasta with my favorite flavors! 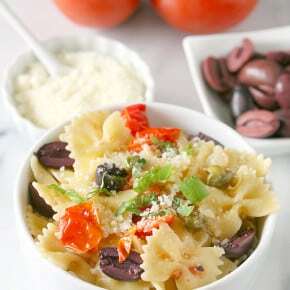 Greek pasta salad has all my favorite flavors! So fresh and delicious! 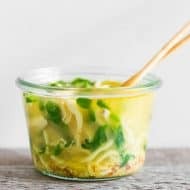 Love this easy pasta dish! My favorite flavors (and gorgeous photos, too)! Very colorful! 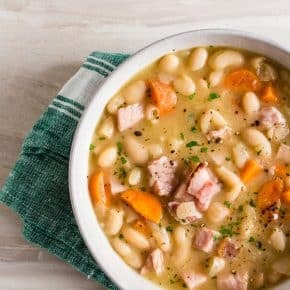 This would be a great dish that I could take to my Sunday family potluck dinners. Ooh this looks wonderful! 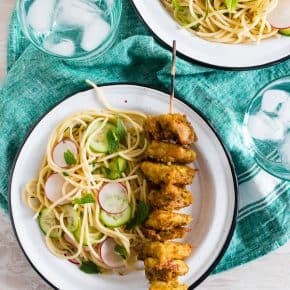 I am a very big fan of quick, but homemade dinners and this is right up there! 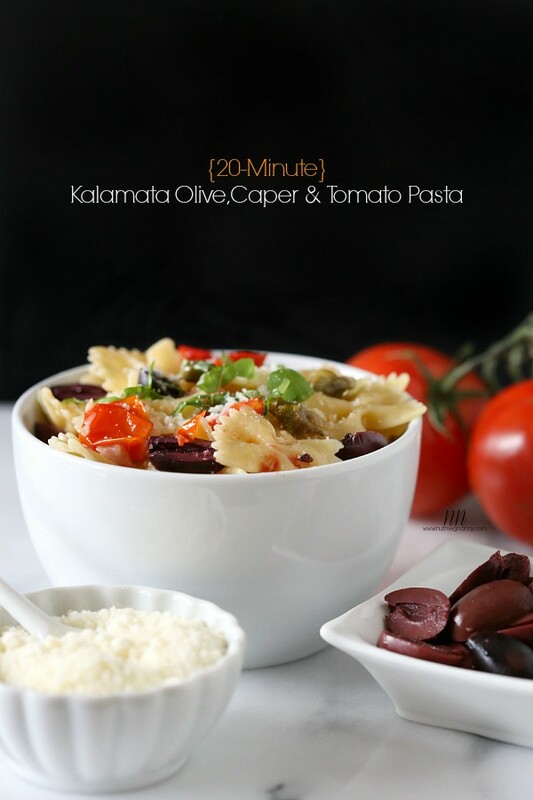 My father is a huge kalamata olive fan, this would be a nice treat to serve him next time I am making a family dinner. Thank you! Your photos. Honestly. They blow me away. Pasta like this is always a good idea. I love this recipe! This looks delicious and I just watched that standup on netflix last week. Hilarious! 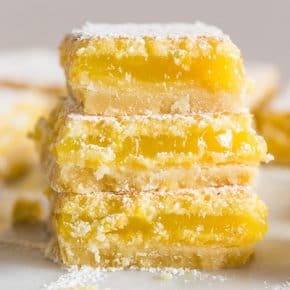 This looks so delicious and beautiful! 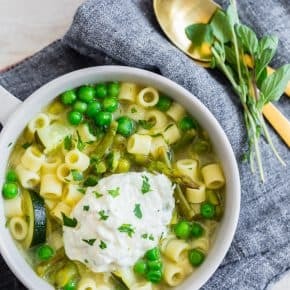 Thanks for sharing, this recipe sounds great! My kind of dish for sure. Quick, colorful and salty. Love it! Yep, I don’t know that John fellow. I better get with the program. My BFF lives in New Zealand. She comes to the states every 3 or 4 yrs. I made it down there once—-and of course had a fab time. It’s wonderful you go to spend time with her. We women value our women friends deeply. The recipe is pretty cool. The dish looks kind of perky for some reason, which is a compliment. My best friend lives in Cali, so I totally get you on the distance. It is hard! But when we see it’s each other, it makes it all the more fun, I think. 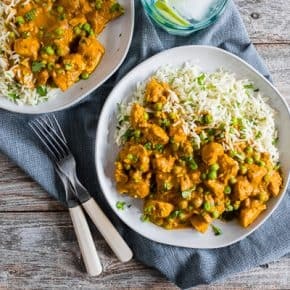 This is such a great quick and easy meal!